Disclosure: This is a collaboration post. We landed in Budapest at night to be honest I wasn’t sure what to think based on first impressions. There was some disorganization in the airport, and our taxi driver didn’t say a word on our drive (shame on us though for not learning some of the language before the trip). The journey in to the city took a while, but things then started to look more lively. I saw young folks walking around laughing, couples popping in and out of restaurants, this was more my type of area. I actually spotted The Corinthia Hotel from a few blocks away. It has a majestic look to it with art nouveau detail and charm, even at night it shows like a palace in radiant white. 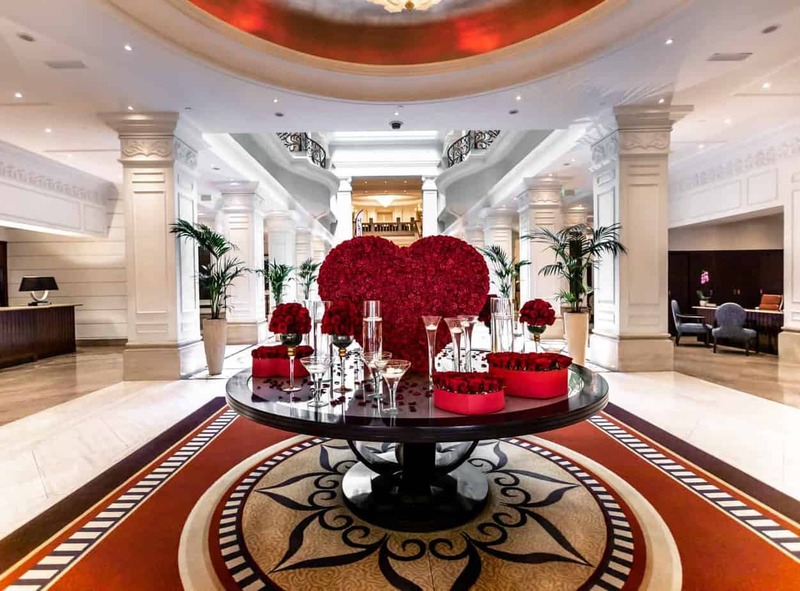 The Corinthia has a rich history, first opening its doors in 1896 as the Grand Hotel Royal. It’s been a ‘who’s who’ of guests staying at the five-star hotel, everyone from royalty to pop-stars to politicians. My husband is a big movie buff and got a kick out of the fact that Wes Anderson stayed here and used the hotel as a muse for his movie “The Grand Budapest Hotel”. Both the exterior and interior have striking similarities to the movie. Upon entering the hotel, I was immediately won over by the stunning Corinthia lobby. It is massive yet has fine touches all around. On a few different occasions of our stay we found different nooks of the lobby in which to relax and catch their live music (piano, Spanish guitars and a trio on the three nights of our stay). The Corinthia restaurants all have a very high standard and the wines and mixed drinks from their bars did not disappoint. 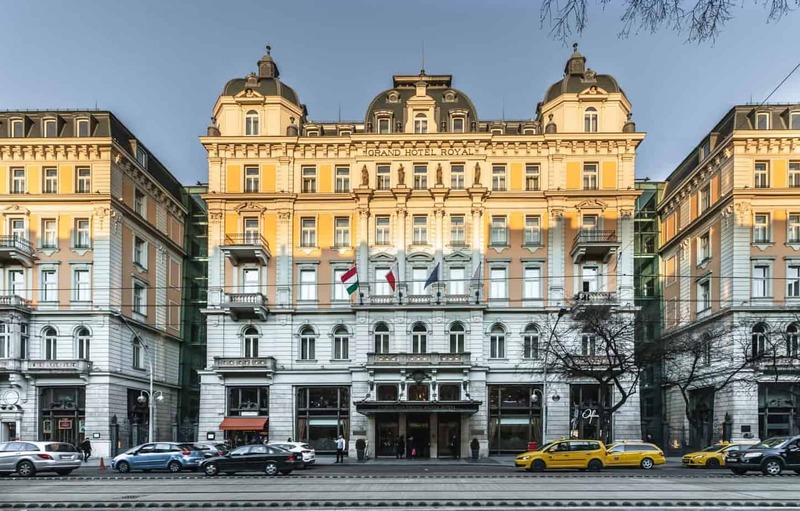 The location of the Corinthia Budapest Hotel is close to all of the main sights in Pest, as it’s right by central city and old town. The area is walkable, I felt safe and found cool spots around (Budapest has retained its character and not become “too touristy” like some other big cities). We walked to the famous intersection Oktagon and also walked to the West End City Center. Our favorite nearby attractions were ruinbars (drink amongst the city’s ruins, how cool is that). We definitely played tourist on our trip and with the transit station right around the corner and a hop-on hop-off tour (which are hit-or-miss, but actually quite good in Budapest). Jewish quarter, museums and more are all close by as well, we just ran out of time to see it all. The Corinthia Spa is beautifully done, everything is extremely classy. 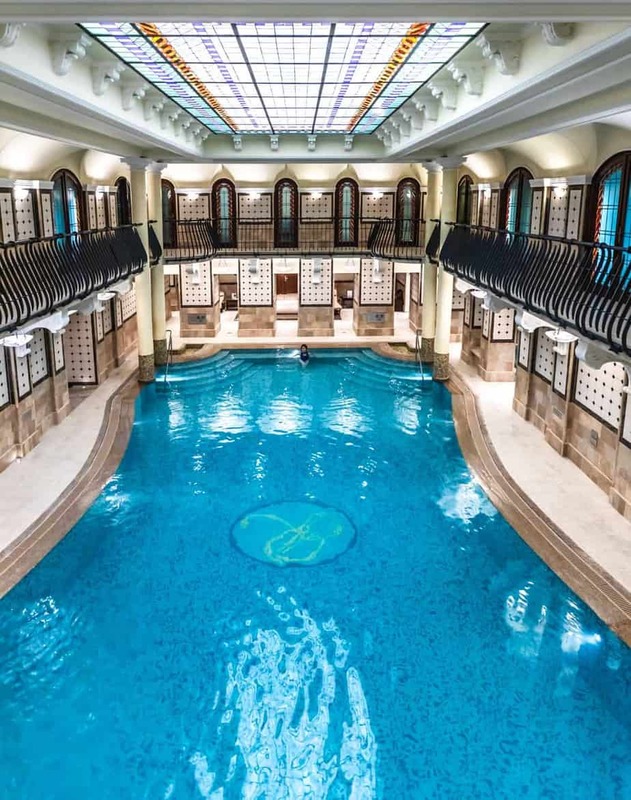 The pool captures old style with modern luxury. I love the stain glass ceiling, overlooking balconies, even the radiant blue water contrasting against the stone and white tile. I woke up early and had the pool all to myself on two of the three mornings, and just a few people swimming around for the first two hours. Late night would have been nice after shopping and seeing sites. The pool is legendary, but don’t miss out on the full experience of the jacuzzi, saunas, steam baths, relaxation rooms and the rest of what the spa has to offer. Each morning we enjoyed the breakfast buffet, with its large variety of foods from different cultures. My favorites were the fish and meat items local to this region, but omelets made to order and other familiar items were all cooked well. Champagne was the perfect way to kick off each vacation day. One tip I have is to try to have at least one breakfast in the open-space atrium. We reserved a table there one morning and it had a completely different feel from the (also fancy) restaurant interior. While most rooms are in the hotel itself, we were in a larger suite to accommodate us since were were travelling with our kids. Our suite was across the way in a connected part of the hotel that has a nature-esque courtyard that my kids enjoyed exploring. The suite was massive, more like a condo than a room as it had a full kitchen, two large and comfortable bedrooms, a dining area and even an atrium with an outdoor table. Our stay was clean and quiet, we never once heard neighbors or outside noise. The two bathrooms were spacious and modern with white tile, and much of the rest of the suite had an art deco design that my husband and I really enjoyed. 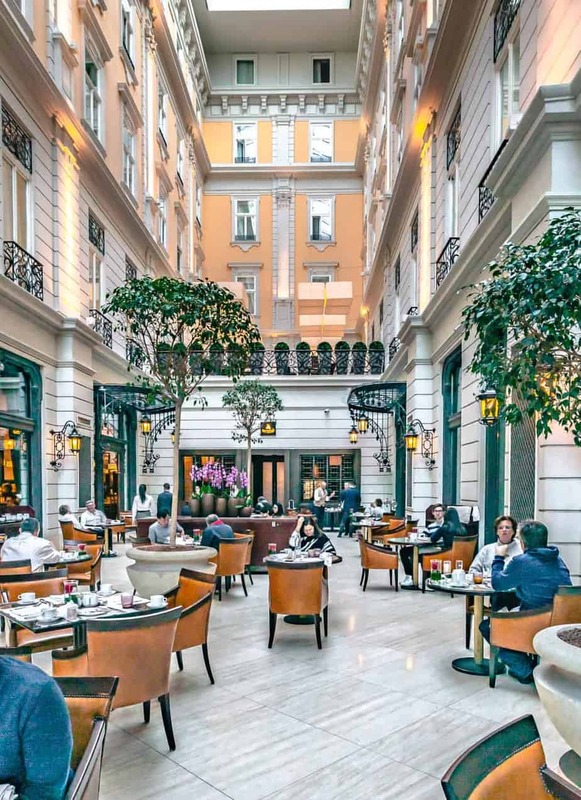 Corinthia has so much other charming features that don’t translate so well to print, you really need to experience the hotel first-hand. – The staff is always attentive and aiming to please. – There’s a nice gift shop with gorgeous jewelry (mostly Bohemian garnets aka Czech garnets that are famous in this region, and a nice selection of crystal all at reasonable prices). – The Executive Club of the hotel is fabulous lounge with drinks and royal treatment to make guests feel exclusive and special. – The four onsite restaurants are amongst the best in the city. Caviar & Bull, Brasserie and Atrium, Rickshaw Restaurant, Bock Bistro. 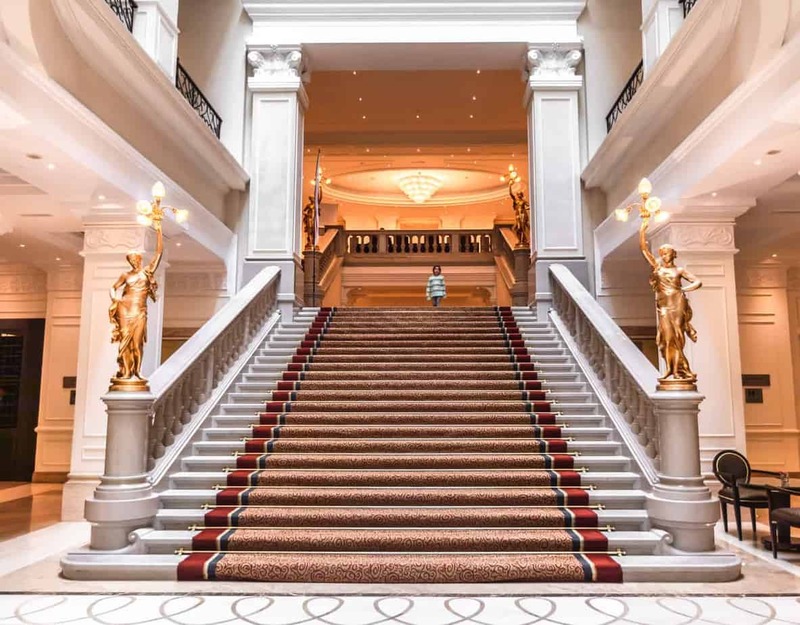 – We passed by the grand ballroom and peaked in, what a gorgeous place to tie the knot or have another special event. As mentioned the lobby and spa both took my breathe away, and all other experiences at the hotel were nothing short of top-notch. 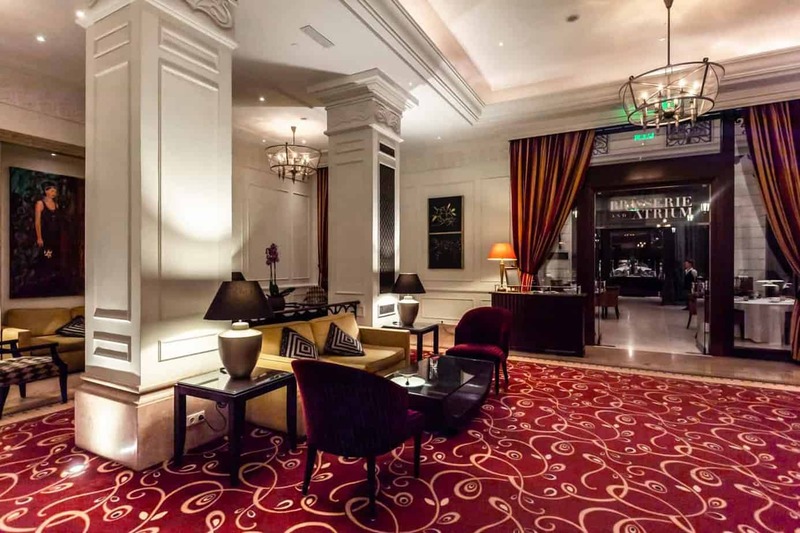 The Corinthia Budapest was perfectly situated for us to get the most out of touring the city, and left us wanting to spend at least a couple of hours each morning and night just exploring and taking advantage of all the hotel had to offer. 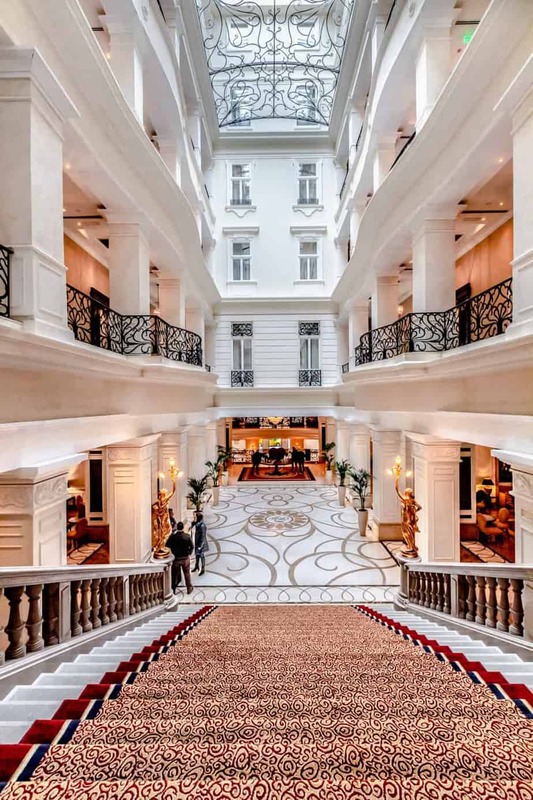 Book your stay at The Corinthia Budapest! 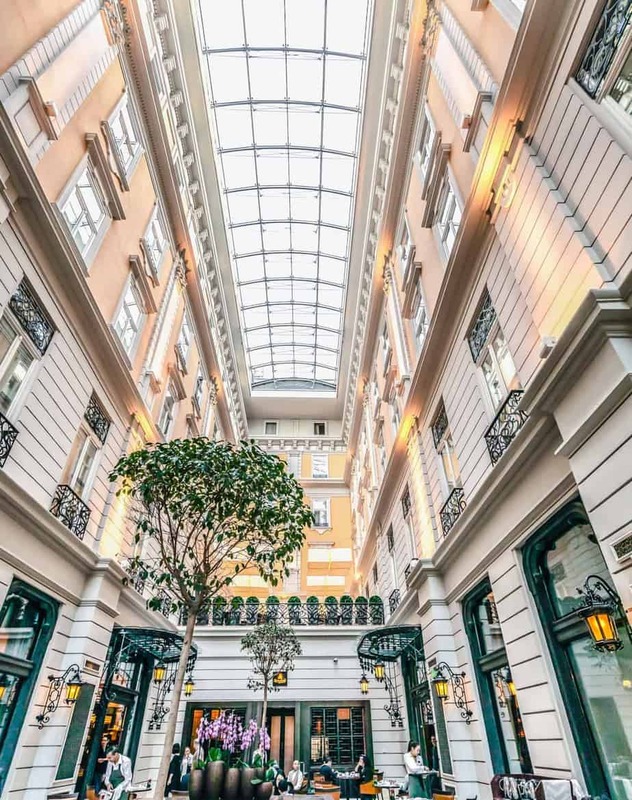 What an absolutely beautiful looking hotel to go and stay at! It looks so relaxing and the architecture is just beautiful as well. Wow, I am impressed for sure. This looks like an incredible place to stay. I just love all the decor and it just seems peaceful. What a gorgeous place. You don’t see many hotels like this one any more. They are all sleek and modern looking, which is perfectly fine, but there is something very special about the ones that are glamorous. 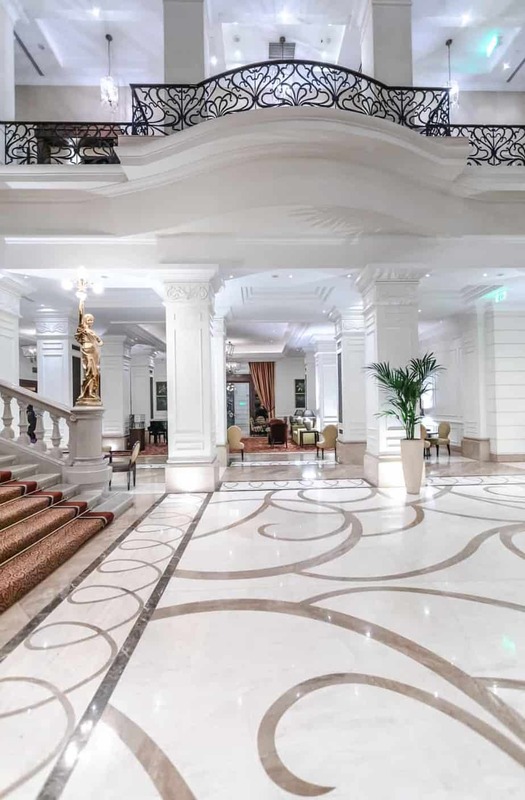 What a big fancy, fancy place to stay while in Budapest. It is very beautiful. 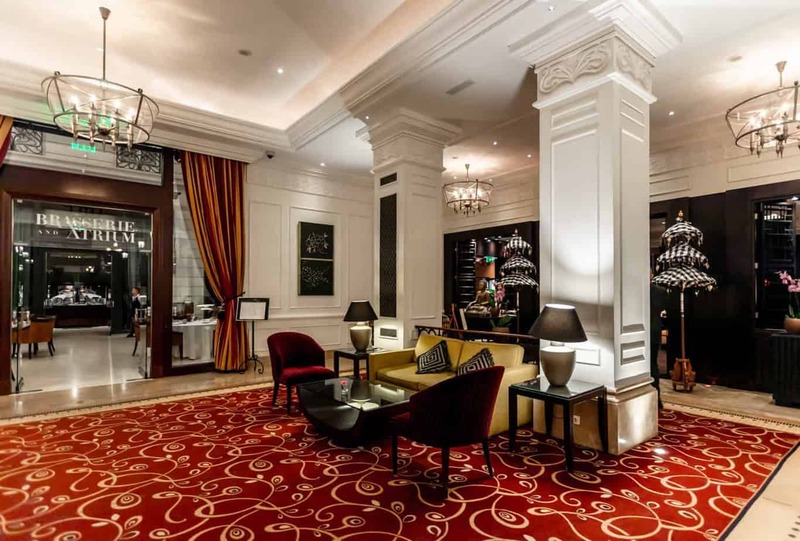 The hotel looks wonderful, so bright and spacious and well decorated. I would love to go and stay there with the family. This is now on my bucket list. The architecture alone is gorgeous. That pool is built for a king. Looks like a palace! WOw, that looks like an incredible hotel. I love the lobby. It’s so elegant and chic. This hotel is stunning. All of the architectural detail is beautiful. I would love to visit and stay here. The hotel is gorgeous! What a wonderful place to return after a day of sightseeing. This hotel is absolutely stunning. I would love to stay there one day. Oh my goodness! This is wonderful! It looks like a palace and the place was really amazing. I would love to experience this kind of hotel. Stunning! The hotel looks luxurious! I am sure you all had a great time there. This place is so swanky! I would love to stay here! Wow! Just amazing! What a gorgeous place to stay and relax! it’s is just beautiful, the Spa looks amazing, I am sure you had a lovely time there. Thanks for sharing! What a gorgeous place to stay in for a relaxing vacation. The skylight ceiling is great, it really brighten up the place.